Kelly & Austin: Nick and Carrie's Excellent Adventure! What do you do when the bride and groom are from different parts of the country, not to mention the fam? Destination wedding at a wonderful location! Nick and Carrie chose the gorgeous wine country area just outside of Santa Barbara, where the film "Sideways" was shot, and was that ever a great idea! Austin and I hopped the connecting flight from LAX to Santa Barbara and gawked the whole way as our little plane flew up the CA coast over azure Pacific waters with hazy mountains gracing the coast. It was amazing. It was just the perfect choice for an intimate wedding with immediate family and the closest of friends. First and foremost, it was a wonderful time for us to hang with the fam and meet new people. Austin and I particularly enjoyed this while we were out at the local wineries tasting and mingling. The scenery and amazing wine and good company couldn't be beat. 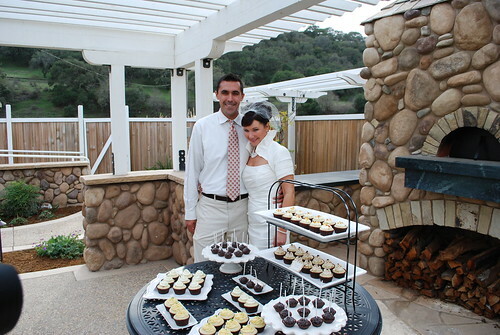 As for the wedding day- being whisked away in limos to several different wineries for the ceremony, luncheon, and cupcake reception was a wonderful way to do a wedding! The food, wine and dessert(!) were all out of this world- the bride and groom did a great job! Just viewing the scenery out the limo windows was wonderful and then hanging out at wineries- wow! All in all, a big thank you to Nick and Carrie for making this all happen and to the family and friends of the couple for making it a beautiful, memorable experience. All those cakes look sooooo yummy. The bride and groom look good too of course.